Competition for each dental patient is fierce. Dentists are being impacted by the decline in adult dentistry, the increase in competition, and the potential chance that corporate and group practices will swoop in – if they haven’t already. Find out who is between you, your patients, and your prospects. As a dentist, it’s imperative that you understand your local competitive landscape so that you can better determine where and when to allocate your marketing resources. 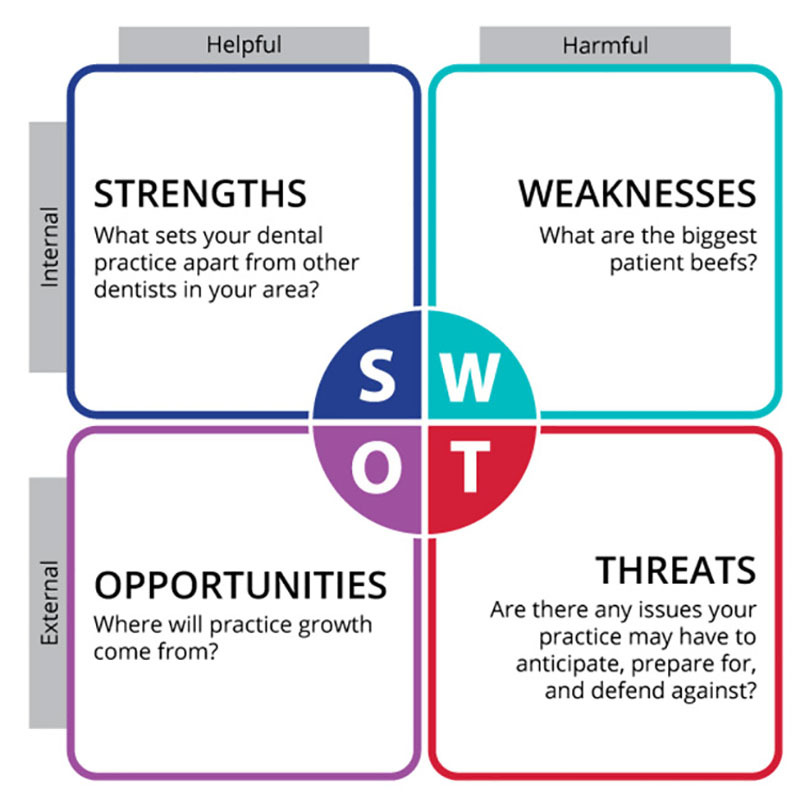 Are you on top of your dental practice SWOT? When was the last time you conducted a SWOT analysis with your team? That’s the identification of internal strengths and weaknesses and external opportunities and threats. As a small business owner, you may not realize how revealing a session like this will be and how helpful your team can be in coming up with solutions to take better advantages of your strengths and how to eliminate a weakness. Collect marketing from your competitors. Your dental team members who live in your practice market area can collect every flyer or advertisement received at their homes from dental/healthcare competitors. Use this information to fortify your marketing strategy. Patient-facing staff should report their biggest competitive challenges or obstacles (e.g. Dr. Jones has Saturday appointments and we don’t) at weekly huddles. Survey your dental patients to find out what services they want – and what they don’t care about. Read competitor reviews and pay particular attention to 1-2 star reviews. What do people dislike about your competition? If you’re performing better, that’s your opportunity to stand out as a unique option for your community. Brainstorm ways to improve practice operations and make strengths stronger. Competition can make you stronger.Weaknesses can become opportunities for growth. Know who you’re up against so you can give your prospects concrete reasons why you are better. And know where your competitors are located so you can better allocate resources for better marketing results.